If you’ve come to Key West to laze around on a beach, you can definitely do that, but that would be shameful waste of a holiday when the Key West water sports scene is second to none. 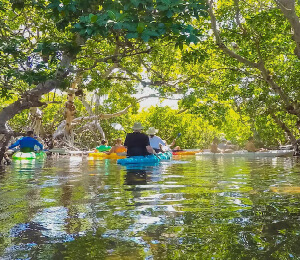 Nowhere in the United States is there a better variety of water play activities than along the Florida Keys, and with this in mind, when you’re putting together your Key West itinerary, know that there are plenty of tour options that allow you jam-pack your day with as much fun in the sun as you can handle. The Power Adventure is just one of several examples of a non-stop, fun-til-you-drop sort of Key West tours. The tour lasts six hours, and begins at 10 a.m. with a calm ride out to the reef on a spacious sixty-foot powered catamaran. Designed with comfort and luxury in mind, there is plenty of room on board to soak up some rays, and relax as you're whisked off to the only living coral reef within the continental United States. Once the boat docks, grab a snorkel, throw on some fins and jump into the unique world of Florida marine life. Watch as schools of fish zip around the reef, beds of seagrass dance with in time to the gentle rhythm of the warm currents, and if you’re lucky, maybe you’ll see a curious dolphin or two! While on board, visitors are invited to try their hand at paddle boarding, jet skiing, or water kayaking. And for family fun, a water trampoline and water slide create the perfect fun filled family environment. Lunch is served onboard and with plenty of soft drinks, bottled water, complimentary crisp wine and refreshing beer, you’ll want for not on any Key West water sports activities. An all-day action-packed adventure that is sure to please anyone in the family. The day begins with a homemade continental breakfast, then snorkeling at the Great Florida Reef, home to millions of marine plants and animals. 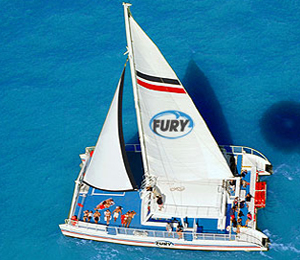 Then we set sail for the backcountry where we'll anchor for a buffet lunch and all the watersports you can handle. 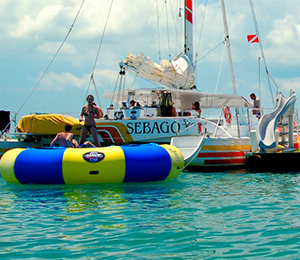 Activities include parasailing, paddle boarding, jet skiing, waterslides and more. These tours fill up quickly, so make your reservations today! Do you have what it takes for our Do It All package? This 6-hour adventure includes 12 watersport activities all rolled into one amazing tour. Our luxurious double-decker Gold Coast Yacht takes passengers a few miles out to sea and anchors while the water-based playground arrives around us. Enjoy water skiing, parasailing, snorkeling, paddle boarding and more in this all-day trip that's guaranteed to wear you out. A delicious lunch served on-board is included, and our adult guests can enjoy our cash bar and complimentary beer. 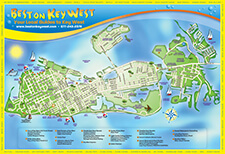 Want to experience one of Key West's combo multi-activity packages but do not have time for a full six hour experience? 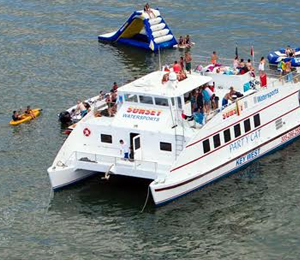 Then check out the Key West Ultimate Express, a 3.5 hour water journey that includes jet skiing, parasailing, kayaking, banana boat rides, and various water toys. 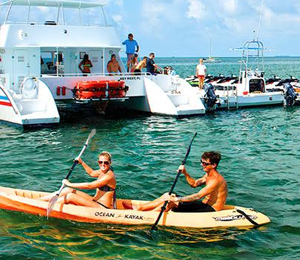 This trip is great for people who want to get out on the water to experience some of the most highly-rated Key West watersports and activities. Created for real water sports enthusiasts, the Ultimate Adventure includes a full day of fun and excitement above the clear waters of Key West. 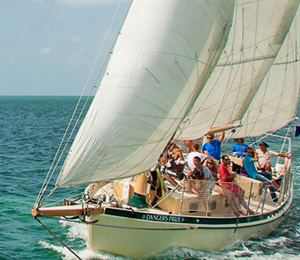 The time you spend abord the Ultimate Adventure will make your trip to Key West completely unforgettable!